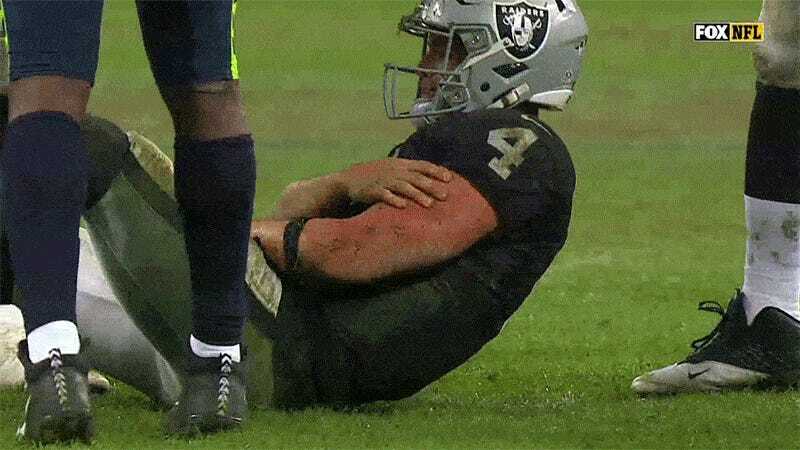 Derek Carr, like the Raiders’ season, is well and ruined. The 27-year-old quarterback, who just two seasons ago looked like he would be the steady hand guiding the Raiders’ offense for the next decade or so, is now a lame duck. Khalil Mack is gone, Amari Cooper is gone, the Gruden-designed rebuild is officially on, and Carr has reportedly lost the confidence of his teammates. Raiders headquarters is not the best space for Carr. The belief in him has deteriorated, perhaps to irreparable levels. Team sources describe a fractured relationship between Carr and his teammates, mostly because confidence in him has waned. It certainly didn’t help when film showed what looked like him crying after being sacked and injuring his arm. They saw his face. They heard his whimper. They witnessed him explain on the sidelines. They assuredly watched it again in film session. It’s hard to see how Carr can lead this team again. You almost have to admire Jon Gruden’s ability for destruction. Gutting a roster and engineering a very embarrassing and perhaps unintentional tanking campaign is one thing, but an NFL season isn’t a true disaster until the quarterback has been reduced to a blubbering mess whom nobody likes. And it’s only Week 7! Imagine what more awaits.